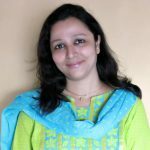 Hi everyone, this is Hussena from Quill and Punch Works, and I am super thrilled to be a Guest Blogger this month at the Spellbinders blog. 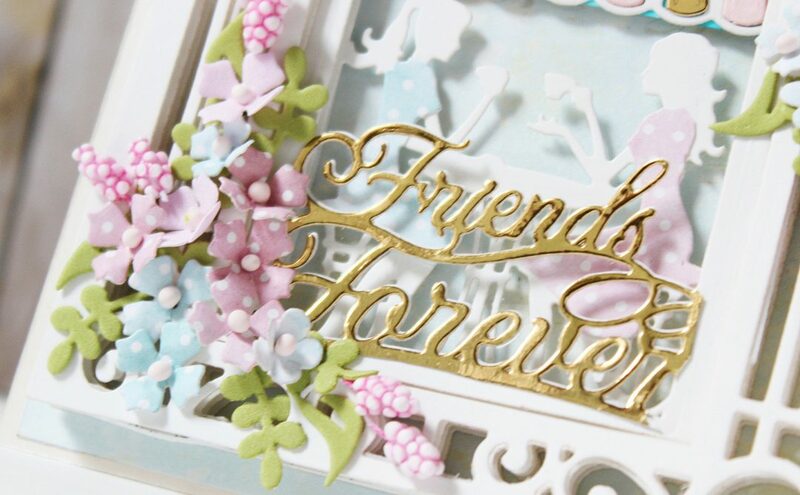 I will be showcasing the new range of 3D Vignettes Die Collection by Amazing Paper Grace. I have two projects to share today. First up, I have a very intricate and detailed layered card, while the second project is a favor bag. I will start with the card first. 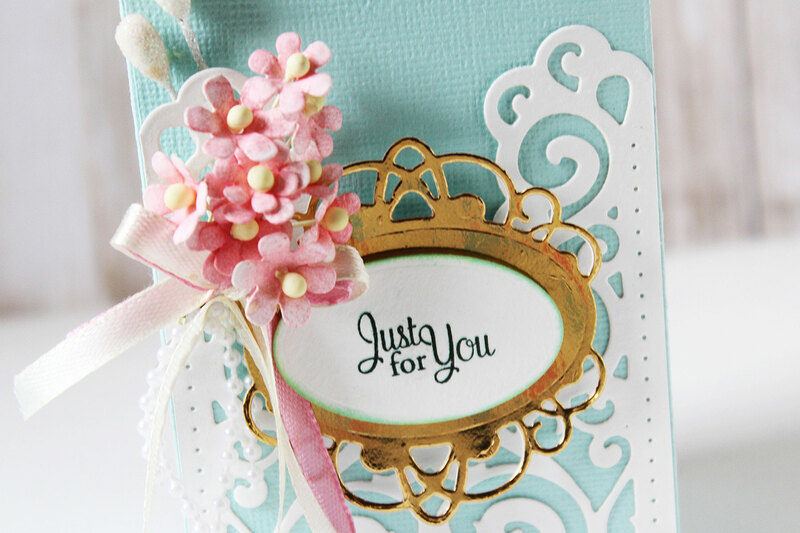 I have used the Grand Arch 3D Card dies for creating the background for my card. I die-cut it out of some white, heavy-weight cardstock and coloured it using a teal colored ink. 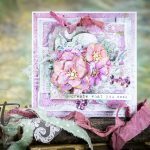 The elegance of these dies is something I truly love, and there are so many possibilities with them. 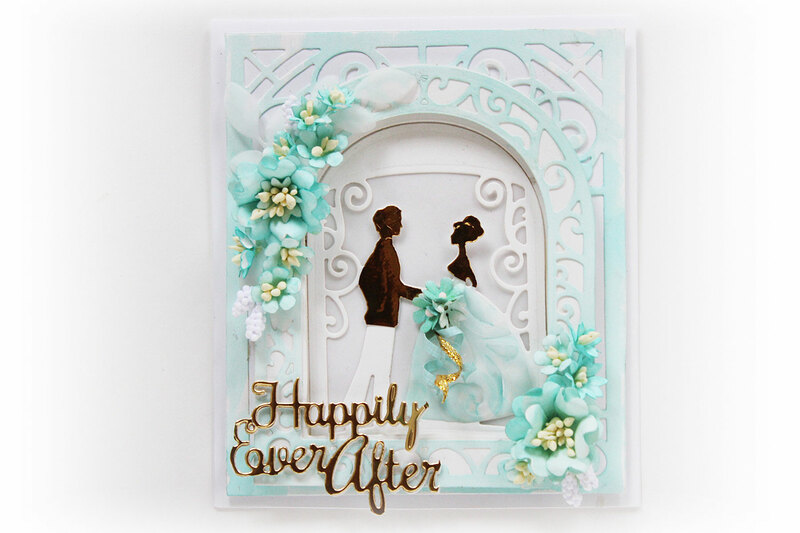 The gorgeous couple image is from the Happily Ever After set. I cut out the die twice, once from white cardstock, and the second time using gold foil cardstock to make the images of the bride and groom stand out. 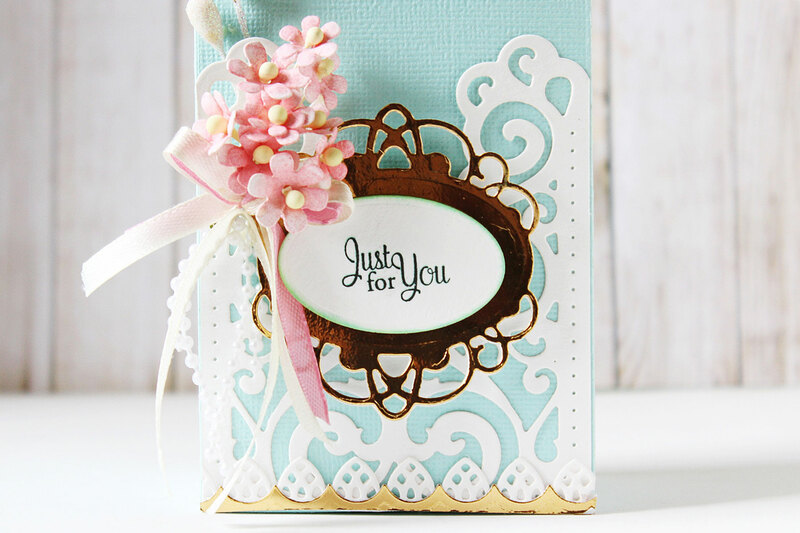 The lovely bouquet is made using the small flowers included in this set. 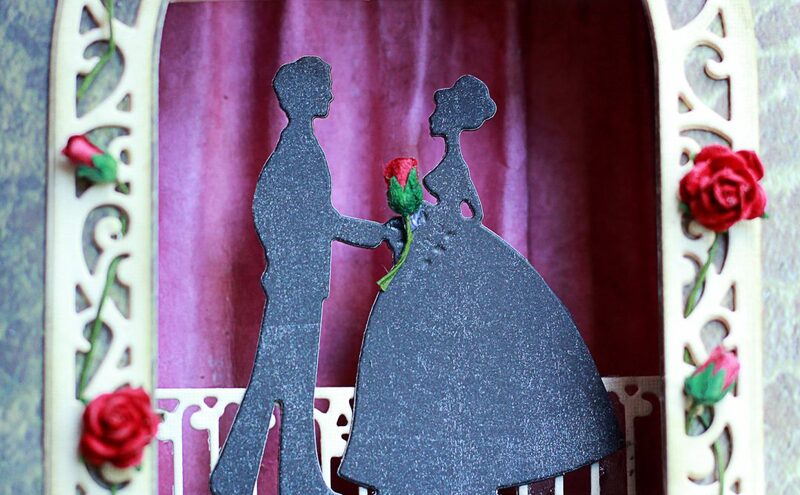 They were die cut, colored and then shaped to create the 3D look. 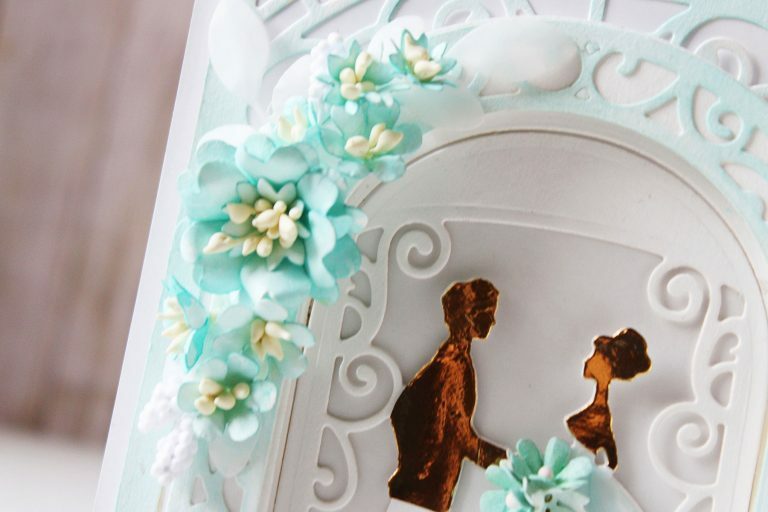 The dress for the bride has been embossed using the Filigree Veil Dies on vellum, and colored lightly from the back of the die-cut to give it a teal tint. 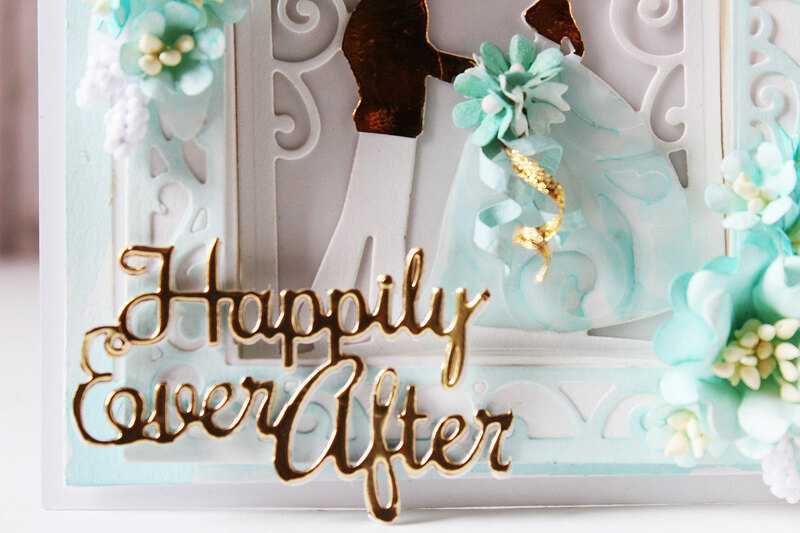 The Happily Ever After sentiment has been cut from one of the dies from the Happily Ever After dies set. I snipped the word die cut from the frame. It was cut out of some gold foil cardstock. The flowers on my card are all handmade. I cut them out using the Cinch and Go Flowers III dies. I also added some leaves which were cut from vellum using dies from the same set. The Arch shaped frame is from the Ornamental Arch dies. I first cut the arch outline, and then layered it with the arch inlay die cut. 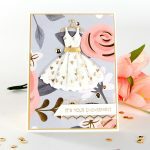 I really enjoyed creating this card, and specially working with Becca’s designs. They make any card look so gorgeous! Here is another look at my card, showing you the dimension and the gold foil. The second project that I have to share is a gift bag, which coordinates with the card. I used similar colors in both, so that they could be given as a gift set. 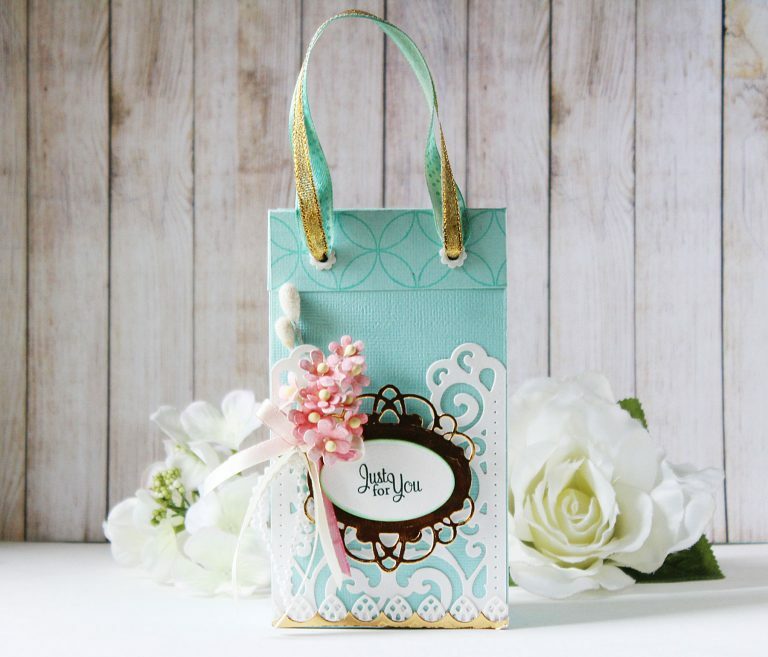 The gift bag was created using a Punch Board. It’s a medium sized bag, the dimensions being approximately being 11 inches X 3 1/2 inches in breadth. 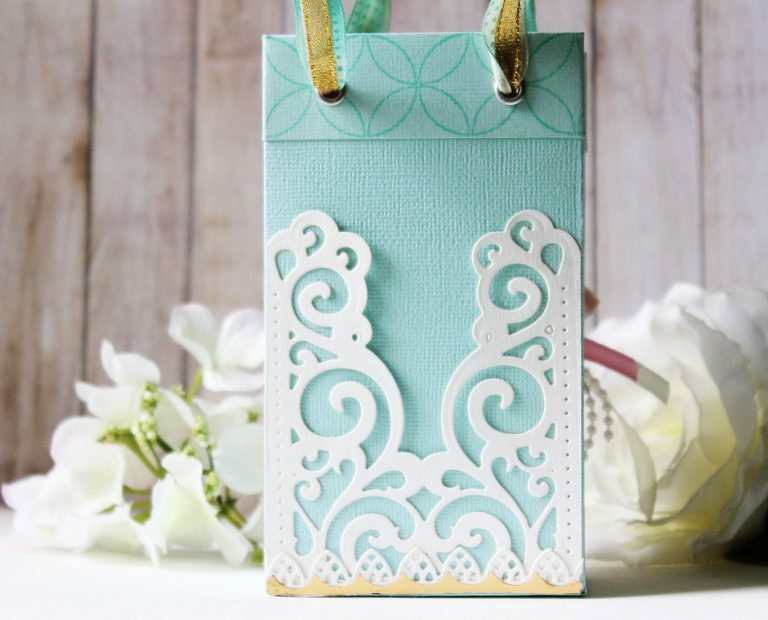 I have used the Filigree Veil die set to cut out the two white pieces on my bag. The design is really pretty, and would work so well as card flaps too! The lil’ flower cluster is created using the tiny flower dies from the Double Bow and Flower dies. 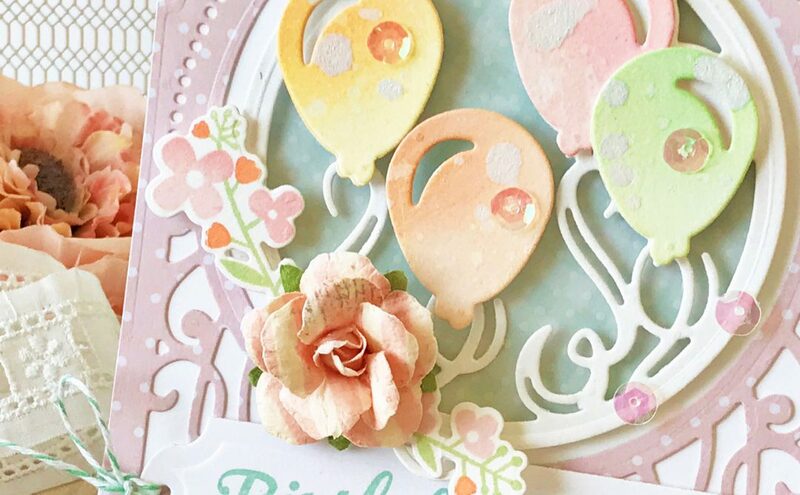 I love using my dies to their fullest capabilities, and the tiny flowers are really perfect for floral bouquets. 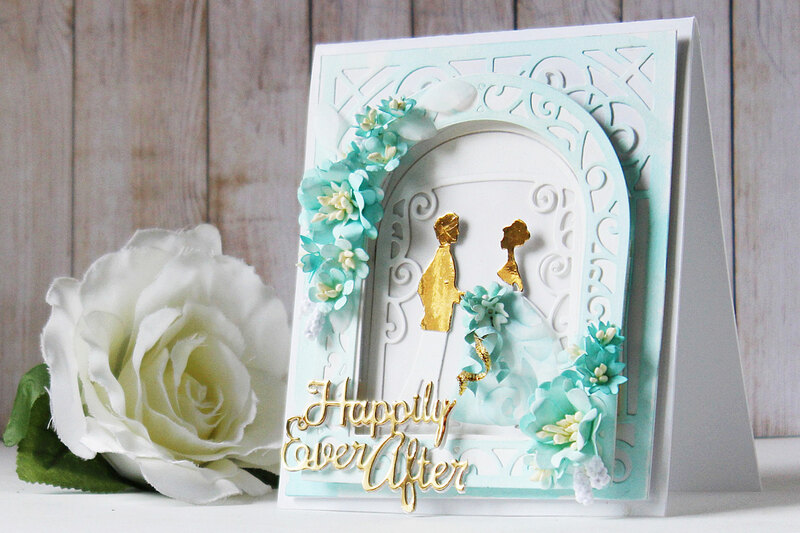 The elegant frame has been cut out from gold foil cardstock from the Grand Dome 3D Card dies. The frame worked out perfectly, and I think it compliments my florals really well. 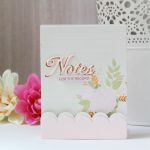 The white border on the bottom is actually from the Tiered Rosettes die set, but I have used it as a die cut border here. I went ahead and decorated the back of the bag using the same Filigree Veil dies. I think it completes the look. What do you think? Thank you so much, for taking out time and reading my post. I really had a great time working with the 3D Vignettes collection, and am honestly spoilt for choice! I have a lot of project ideas using them, which I will be sharing in my upcoming posts. Till then, happy crafting! Hussena thank you so much for sharing such an amazing post !!! and the detail on how you achieved the outcome is so well done. You did an outstanding and beautiful job on the card and the matching bag. I love the colors that you have chosen as well. I do agree that the back of the bag compliments the front of the bag. Thanks for sharing!!! Absolutely stunning!!! I’m sure that Becca is beaming! I love the colors, the detail…okay, everything. I only wish I had a special friend with an upcoming wedding. Bravo! This is absolutely gorgeous! I just love your work as each and every creation is so well designed and implemented. This is no exception! 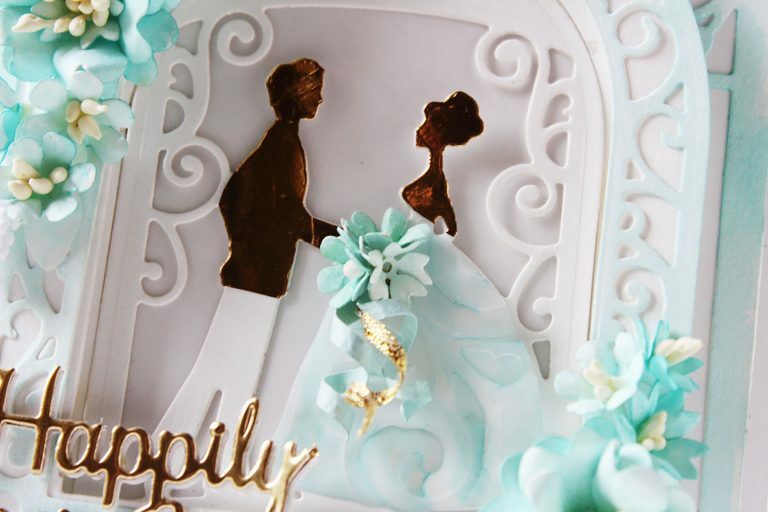 Love the depth you have given to your handmade flowers and the embossing of the bride’s dress is so clever! you rocked your post! 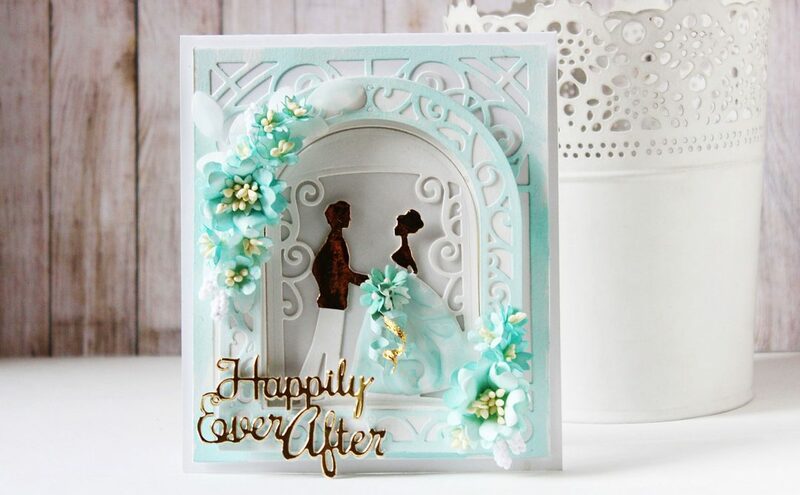 Gorgeous wedding card! The colors are just perfect for a Spring wedding! Absolutely stunning! Hussena, these are all magnificent! Thank you so much for breathing such beauty into my dies!! Gorgeous work!! WOW Hussena such beautiful projects and so proud of you !!! Great going gal !! 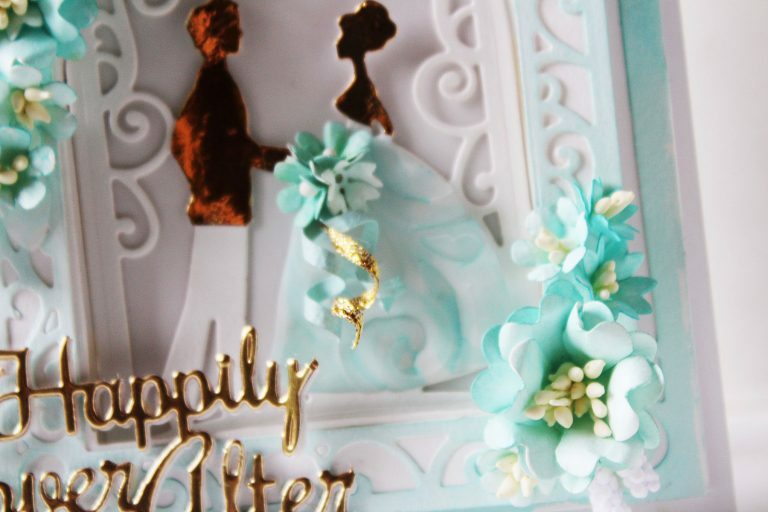 This is a stunning creation <3 so happy for you Hussena! Love love love every little details from the gold dipped figurines to the swirls of the ribbon! Gorgeous work!